So it looks like Kim was right on the money with what she found about the Wii. 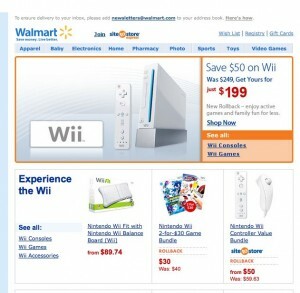 I just received a Price Drop email from WalMart telling me the price just dropped $50 to $199. 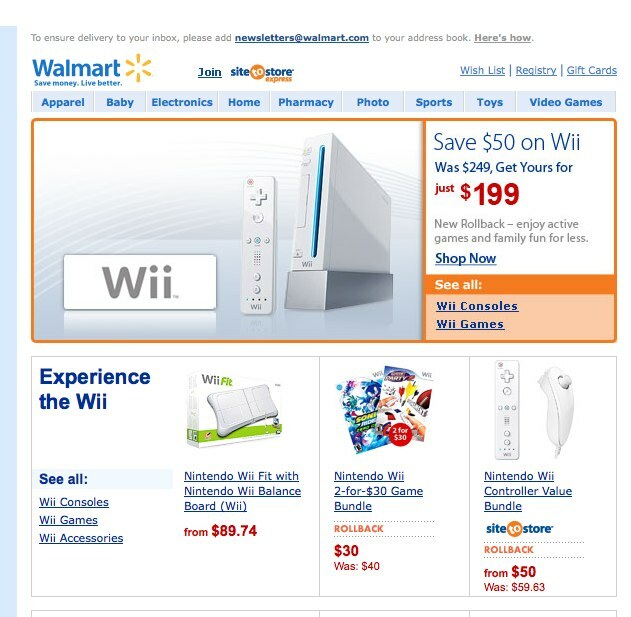 I guess since every year the holiday shopping seems to start sooner, the timing is perfect :) I personally only use the Wii when family or friends are over, so games like Rayman Raving Rabbids 2 & Wii Sports are great. Everything else, eh I’d rather play on my PS3 or Xbox. Not really a big shock, what with the pricecut on both the Xbox 360 and the PS3. It’s the only way they’ll manage to stay competitive considering the cortcommings of the Wii compared to the other consoles. Got a Wii myself, but it’s not been osed for well over six months, not even by the kids. For some reason none of the games that’s being deveolped for it or recently shipped out appeal to me. At all. They just look like rehashes of old stuff or simply too kiddie-like. Wish they’d concentrate a little more on oldschool RPGs like the SNES used to be known for (in gameplay, not graphically). Chrono Trigger, Earthbound, FF VI and the like were truly epic games. Nintendo should look at their roots and figure out what made them great to begin with, like they (to a certain degree) has done with the DS. amen sister! playing zelda on my ds was awesome!